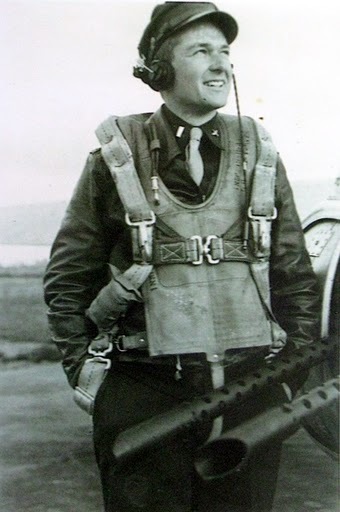 Lt. Floyd Cole is pictured in his uniform wearing his parachute just before climbing aboard the B-17 bomber he piloted on 30 combat missions over German occupied Europe during World War II as part of the American 8th Air Force. Photo provided. Floyd Cole piloted a B-17 bomber on 30 combat missions over Nazi-occupied Europe during World War II. He was a member of the 452nd Bomb Group, 8th Air Force that flew from a field near Norwich, England. “We were a lucky group because we were almost never attacked by German fighters. The Germans didn’t have enough fighters to attack the whole flight of bombers, so they would pick out a particular squadron and attack it,” Cole said. “It was just the matter of a flip of a coin whether you got hit by German fighters or not. We were lucky and didn’t. 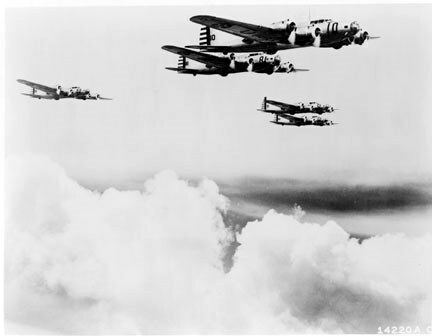 “Three or four squadrons would fly a normal mission. There were 12 bombers in a squadron. There would be a group of six B-17s in the center and a group of three planes off to the right and three more below,” he explained. “It’s usually never mentioned, but to get several squadrons in the air headed for Germany was a big deal. If I was flying lead plane I’d be the first plane off and we’d have a rendezvous spot over further inland. We’d all circle this spot till all the bombers were up and in position, then we’d head toward the target. “Every bomb run was flown at a specific level–18,000, 22,000 or 23,000 feet. The route we took to the target was determined by weather conditions and what the intelligence people knew about the flak conditions,” Cole said. “Normally the group would make a sharp turn just as it started to approach the target. This was done to mislead the Germans about what target we were after. “At that point you had to set up your plane at the appropriate altitude, fly in a specific direction and hold the plane steady in formation. On the whole run, going into the target, maybe 10 minutes out, you were flying straight and level and this gave the Germans time to start tracking us. They would pick up our heading, our altitude and we would have to fly our bombers through a controlled area the Germans set their flak guns at,” he said. Cole recalls a little of his mission to Berlin. “It was an interesting assignment because the Germans would fill a certain air space with ack-ack and we had to fly through it in our bombers. They wouldn’t try and target a particular plane. “I flew a couple of these missions to Berlin. As we approached the city the flak was just like a thunder cloud–big and black. You knew when you were flying through their air space because they were concentrating on it,” he said. How did he feel when he was sitting in the pilots seat? A 23-year-old lieutenant flying a heavy bomber over German held territory with a good chance of never seeing the USA again? “I can remember one mission when flak on the co-pilot’s side came quite close. I just laughed. Looking back on what I did given my age now, it was ridiculous to laugh, but that was my response at the time,” Cole said. His very last mission, the 30th one, Cole has no recollection of at all. He does say he knows he was relieved. “We were just waiting around to be given transportation home. One day someone comes in and says, ‘There’s a movie picture company that’s looking for some British and American soldiers for a scene. Who will volunteer?’ Cole recalled. “The movie they were making in London was called ‘Johnny in the Clouds.’ It starred Leslie Howard, he said. A teenage Jean Simmons had a bit part in the show. “We weren’t doing anything and it was a chance to go to London, so we all volunteered. The picture the British company was filming was a war picture and it dealt with the British side of World War II. “I spotted this girl standing in a doorway on the other side of the room. She was beautiful,” Cole well remembers six decades later. “I went over and talked to her for a few minutes. It was Jean Simmons and she was about 16 with a small singing part in the movie. “When the picture came out I saw it. I was in one short scene that showed a bunch of American soldiers dancing around with English girls,’ he said with a smile. When Cole reached the states he got some time off and then he reported for duty to MacDill Air Force base in Tampa where he trained bomber crews. Eventually he was sent to a base in Avon Park where he remained until the end of the war teaching young airmen how to fly B-17s. After he was discharged he took the G.I. Bill and graduated from college with a degree in engineering. He went to work for Monsanto initially. Later on he got a job with Foster Grant, a New England firm he stayed with until he took early retirement in 1980. Along the way he married Jean, his wife of nearly 60 years, who was a Glasgow girl who came to the U.S. and found work after World War II. Because one if their five children had Down’s Syndrome she became interested in mental retardation among young children and eventually became an expert in the field of early childhood education for the mentally disabled. She traveled the globe teaching others about the field. The Coles’ children include: David, Blair, Craig, Judy and Ross (deceased). This story was first published in the Charlotte Sun newspaper, Port Charlotte, Florida on Monday, Feb. 14, 2011 and is republished with permission. Click here to view Cole’s Collection in the Library of Congress’ Veterans History Project. it’s good to see uncle floyd getting the recognition he deserves.